Previously we mentioned about USB to DVI Adapter for Multiple High Resolution Display from Sewell, now there is a similar product being released by Villagetronic targeted for PC users that doesn’t like to use conventional display output. 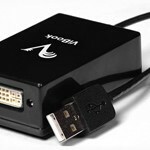 Named as ViBook, it is a tiny yet powerful USB graphics solution that can connect any LCD monitor to your USB ports conveniently. Amazingly, it can support up to maximum of 1680 X 1050 wide screen resolution without any technical limitation. As similar to Sewell product, there is a way to connect to as many as 6 different displays, with condition that you get six ViBook with each DVI port connect to one display (maximum of 22-inch display). Another major advantage is this new product is designed to be small enough to be mounted behind any kind of LCD monitor’s panel so that you can have a neat working environment in space constraint office space. The new solution is compatible with both Mac and Windows PC systems, and priced at only $130, it is quite an affordable solution especially for those users that need multiple panoramic views for more effective work.